This is a great dog story, a wonderful story about a girl finding her place in the world, and a story about friendship and family. Definitely worth reading! Lucy Callahan was struck by lightning. She doesn’t remember it, but it changed her life forever. The zap gave her genius-level math skills, and ever since, Lucy has been homeschooled. Now, at 12 years old, she’s technically ready for college. She just has to pass 1 more test–middle school! 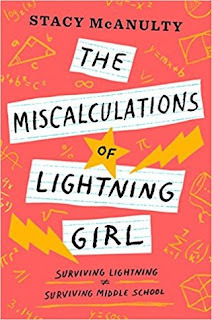 The Miscalculations of Lightning Girl, written by Stacy McAnulty was published by Random House in 2018. One of the things I liked about this story is the way Lucy talks about her disorder and owns it. It’s a part of her life and she’s coping as best she can. Lucy faces challenges of bullying, making and keeping friends and working on school assignments. I loved the clever way she brought her math skills into play when working on her school project. I also liked her relationship with the shelter dog, Pi. I don’t remember the moment that changed my life 4 years ago. Call it a side effect of being struck by lightning. That bolt of electricity burned a small hole in my memory. It also rewired my brain, transforming me into Lucille Fanny Callahan, math genius. This is another great example of a first person, present tense narrator with a strong voice. There’s a slightly humorous tone to the story that reminds me of YA novels. I will never understand people. In algebra, you can solve an equation when you have 1unknown variable. People are equations with dozens of variables. Basically unsolvable. Some great things about this book: There’s lots of talk about math, in a fun way. The main character, Lucy, spends a lot of time in the book working on a school project with a small group—to do something to make a difference. Lucy lives with her grandmother, so I liked that it speaks to kids who don’t live with one or two parents. Lucy’s anxiety and OCD is shown in a straightforward way that makes it easy for kids to relate to. "Pi?" I whisper the dog’s name, and he turns to look at me. That’s when I notice that 1 of the black spots on his back is the shape of a lightning bolt. For more great middle grade reads, check out what's happening for Marvelous Middle Grade Monday over at Greg Pattridge's blog. This sounds like a fun read. And while I wasn't a genius, I was smarter than most everyone in my class and probably went through similar experiences to Lucy. Glad you liked it. Thanks, Natalie! I think you might enjoy this one! I can't remember whether I bought this book or not, but after reading your review, I'll have to try it! Lucy's anxiety sounds like something I could relate to. Thanks so much for the review! This was positive and upbeat despite the challenges, which is something I wish we saw more of in MG Lit! I think my students will really enjoy this one. I agree. A lot of MG is very serious at the moment. I just finished this one and enjoyed it very much. The scenes in middle school were quite realistic. Thanks for your thoughts including the connections to teachers and writers. I'll add my own review when time allows. Thanks for sharing this book on MMGM. 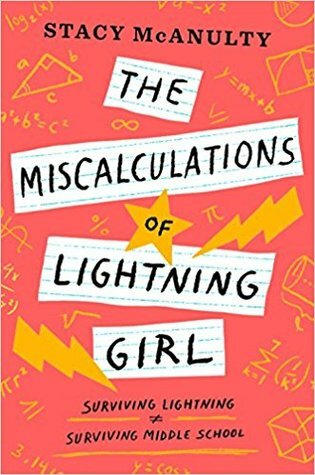 I enjoyed your review and your insights into the main character's mathematical skills. I've added this one to my TBR list. Thanks, June. I really enjoy reviewing and thinking about books when I have time. This sounds like a book worth spending time with. What fun! I enjoyed your thorough review for readers and teaches. Enjoyed your review! This sounds like a fun read. Also, randomly, my great-uncle was struck by lightning twice. Unfortunately, it did not turn him into a math genius :). Wow! That's hard to imagine!